Editor’s Note: Linda Ranson Jacobs is back again this week with another “Top Ten” list. 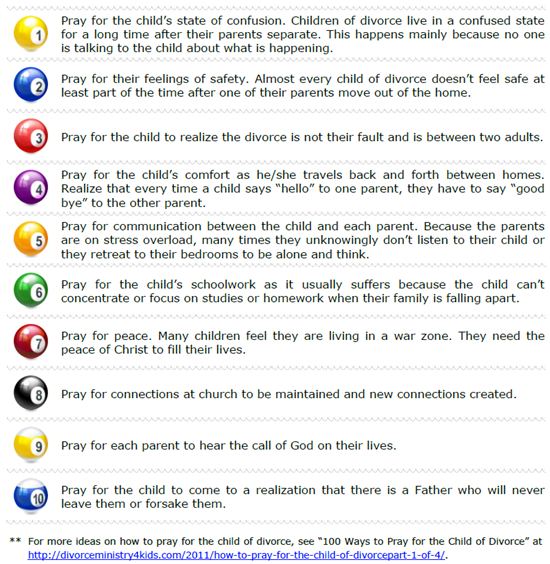 This week, she offers ten ways to pray for children of divorce and their families. You can access a printer friendly (and shareable) pdf version of this list by clicking anywhere in the list below. Thank you for this! As a mom and a step mom of 5 kids, it is very hard to be so helpless at times when they are at the other parents and things are said or done that are out of my control. Or even things that go on in our home that we may not even realize. This made me cry as I read it. Some of these things are things I have not even thought to pray for. And I know that when all else fails I need to pray. But that even frustrates me because I can be so angry or emotional, or just so lost myself that I don’t even know what to pray for, for the kids! Just having a list of some direction on what to pray is HUGE for me! It is going to get printed and hung in my bedroom so that I can just start to pray this list and see where my heart leads me to speak to God! Cara, It is wonderful when the Lord reveals things to us that we need to see. I praise God that this was the case for you when you read this message. Thank you for allowing me to know that this message impacted you. It is an honor to serve our Father in such a needed ministry. Thank you for what you are doing with those 5 kids. Keep the faith.